This design has been around for several years now, and you may have seen others like it, but none as good as the BendPak MD6XP Mid Rise Car Lift. BendPak doesn’t take any shortcuts when it comes to any of their products. Many competitors have models that may look similar, but upon further inspection, you’ll soon find that’s where the similarity ends. They use top quality components and the best power unit in the industry. On top of that, you get BendPak’s comprehensive warranty, which includes one year of on-site service. 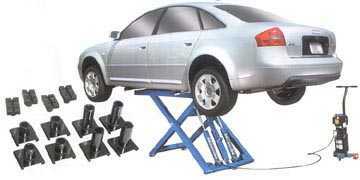 This is one of our most popular and useful Car Lifts we carry. It’s not just popular with auto body shops and brake shops, but it is also extremely popular with the home-hobby, DIY crowd. The features that make it popular are it’s portability, it’s ease of use and the fact that it allows access to most of the vehicle for service. It has a handy working height of 48″ with the shortest adapters and up to 53″ with the tallest adapters. It comes with a free 12 piece adapter set that costs extra with other manufacturers. It comes in handy for home users who don’t have adequate ceiling height for the traditional 2 post or four post lifts. It tows around quite easily with the power unit acting as a dolly. Check it out and get back to us with any questions.